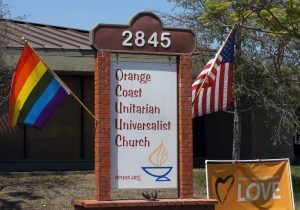 Please inquire about Orange Coast UU Church's facilities available for rent. Our space may be used for weddings, memorial services, meetings, or other religious services. Daniels Hall is a spacious large room for acoustic music events, public gatherings, and even has a full working kitchen with gas burners and commercial refrigerators. Contact our staff administrator by email or phone for pricing and availability: (714) 556-2882.